Of the many realizations that have been derived from Nodism, two of the most interesting are the connection between context and content and the potential isomorphism between context and content and kinetic and potential energy. 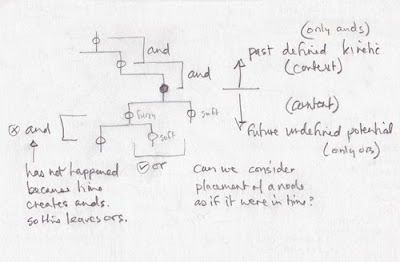 Simply put, context is the nodes along the branch of the hierarchy above a node and content is everything under or inside the node. So if we have node zero / red / bikes / Asia / then the context is red bikes in Asia. The content would be all red bikes in Asia. This would be Lain's red bike, a red bike in a store in Bejing, etc. All would have a common denominator of the context. When you refer to a node its context is defined, it has been determined, it is created by this and this and this, it is in the past. Energy goes into defining it. You have arrived at the node and are rolling with the kinetic energy of context. The content is undefined, it is a series of ors, it could be any one of them only to be determined in the future, we only know if we use up more energy and provide more context. There is the potential to go to any one of the branches. Content is full of potential energy. To define something fully is to move every attribute out of the node and into contextual nodes. This would take all potential energy out and we would reach essence. Contrarily, if we rise up the single hierarchy towards Node Zero, we deplete kinetic energy and gain potential energy. Node Zero is all potential energy. And reality, the actuality at any moment is all kinetic energy. The energy we are talking about is perhaps the energy of essence or truth or logic. There is a more complicated aspect to all this and that is the aspect of relevance. Relevance is most likely not going to fall easily under probability but rather move into subjectivity. Subjectivity does bow to probability in the end. There is also the possibility of truth, essence and logic providing a definitive answer - like in the Glass Bead Game by Herman Hess. Relevance is a whole other article. Santa Fe Institute researchers have demonstrated that many real-world networks can be understood as a hierarchy of modules, where nodes cluster together to form modules, which themselves cluster into larger modules--arrangements similar to the organization of sports players into teams, teams into conferences, and conferences into leagues. This hierarchical organization can simultaneously explain a number of patterns previously discovered in networks, such as the surprising heterogeneity in the number of connections some nodes have, or the prevalence of triangles in a network diagram. This result suggests that hierarchy may be a fundamental organizational principle for complex networks.